I'm sure you've seen more eclipse reactions than you can shake a stick at. And here's my little video from our eclipse party with the students and families of Rhea County Academy. I don't have any grand words of wisdom. It's just an amazing experience. Truly one of the greatest shows in all of God's creation. See it if you can. It's more than worth it. 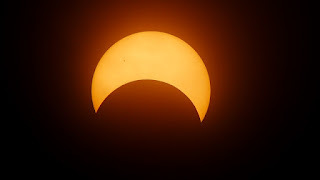 The next total solar eclipses will be in South America, but the US will get another eclipse in 2024. Totality will last about twice as long, and the path of totality will run from Texas to Maine. See it if you can. It's astonishing. OK, I'm going to try to be nice, but I've been reading some unbelievably stupid things on social media lately, so I'll do my best. Apologies ahead of time if you've fallen for some of these absurdities. If you actually believe some of these whoppers, please don't. Stop twisting reasonable cautions into irrational fearmongering. 1. You do not need to stockpile groceries, gas, prescriptions, etc. It's not the end of the world. 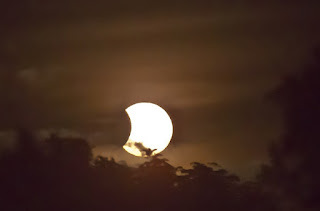 The total eclipse lasts two measly minutes. This is no time to panic, riot, or loot your neighborhood store. Get over it. Stop scaring people. Praise God for the eclipse! Thirty years ago, I was a teenager, and I didn't know half as much as I thought I did. Or at the very least, I hadn't yet figured out how much I didn't know (which as it turns out is nearly the sum total of all possible knowledge). The year was 1987, and a little booklet was circulating at my Christian school: "88 Reasons Why the Rapture will be in 1988." I am very glad to say that most of my teachers and pastors were not fooled. There isn't a lot of buzz about this, but I thought it warranted a few comments. 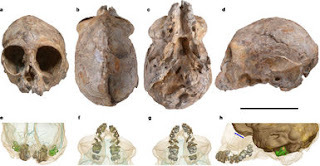 A new report in Nature describes a remarkably well-preserved ape cranium from middle Miocene sediments in Kenya. The authors, Nengo and colleagues, used powerful X-rays to observe the unerupted teeth still in its upper jaw. The teeth are really exquisite! The researchers conclude that the fossil, Nyanzapithecus alesi, is 13 million years old (using conventional dating methods) and probably a "stem hominoid." What does all this mean? It's not much of a human "relative" even from the evolutionary perspective. Here's a quick update of our building project! As always, there have been delays with our construction plans. What a surprise. We've also run into code requirements that have modified our intentions as well. It's been frustrating at times, but we're still amazed and thankful at how quickly things are moving. 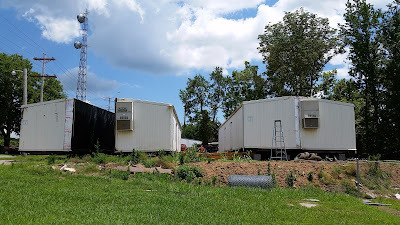 We started out with this just an empty lot, and within a month, the buildings were on site and assembled. Then the guys came in and tore up the ground to get utilities connected. Once the electric was hooked up, we started work on replacing some trim and painting the inside. And that's where we are. We're currently working to finish the classroom, since school starts next week! Then we'll finish the office part of the building. That room will need flooring, paint, and some other minor modifications. God willing, we'll also have a new door, closet, and kitchen. We hope this will be done by the end of September.